In a nutshell – tackling a Gmail mountain can be daunting. 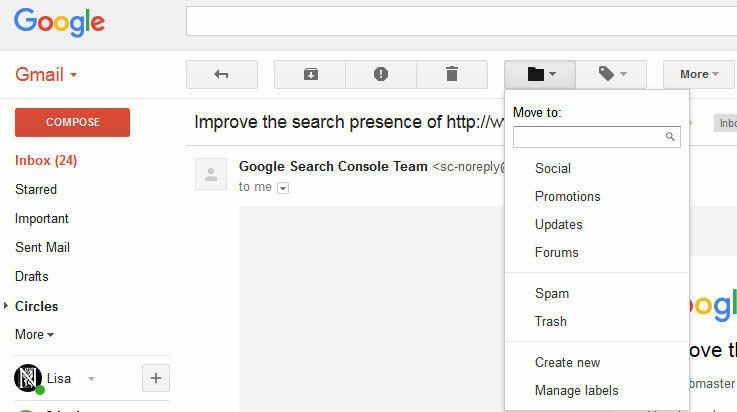 Here are 5 quick ways of decluttering your email if it is on Google Mail. If you unsubscribe to just one thing when you open your email, that will be one less thing you will see in your inbox tomorrow. It only takes a minute to do. Gmail has a handy ‘report spam’ option above each email if they don’t have an unsubscribe option. Gathering emails from one person into the same place really helps you see what you need to keep. Gmail is set up to be search friendly instead of sorting friendly but just hovering over an email will bring up this box. Click on ‘Emails’ to see everything from that sender. You can then choose which ones you want to delete. If you click on an email you will see a number of options at the top left of the screen. 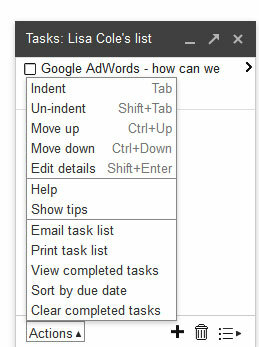 Clicking on ‘Move to’ will bring up another drop down menu where you can create a new folder or move your email to a current one. Once things are in folders they are a lot easier to sort through but even if you don’t get to that stage, folders make your whole email more organised. Prevent your important emails from getting forgotten or lost by adding them to a task list. This appears in the bottom left of your screen on a computer and gives you lots of useful options such as printing or emailing your list. There are better places to store information than keeping it in your emails. If you want to be able to quickly put important dates, reminders or images into a place where they will always be safe and it is easy to find then I cannot fault Evernote (this is an affiliate link!). You can connect Evernote to Gmail if you want to share information with people in your contact list too. Evernote Basic is free and comes with 60 MB of new uploads a month. You can use it on 2 devices and it will sync automatically, so if you need to get to a recipe you have stored while you are in the shop, you can get it on your phone. Evernote works on phones, tablets, Androids and iOS. Gmail can mount up quickly, there is no need to get it all sorted in one sitting. Try one of these tips every day and see how quickly things look a lot brighter in your email!